Preheat oven to 350 degrees F. To a measuring cup or small bowl, whisk together the water and 2 tablespoons of wing sauce. Set aside. In a large bowl, whisk together the flour, onion powder, paprika, salt and freshly ground pepper. Pour the water mixture into the flour mixture and mix until combined. Add the cauliflower and toss until combined. Transfer to a baking sheet and place in the oven to bake until cooked, about 15 minutes. (I used an air-fryer and it only needed about 10 minutes). 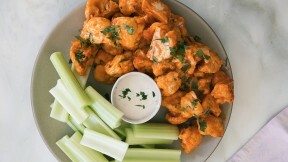 Add the cauliflower to a bowl and toss with the additional wing sauce. Serve with slices of celery and ranch dressing.